Grant Wood was born February 13, 1891 in Iowa. He enjoyed art as a boy and when he graduated from high school he took art classes and even taught art in a one room schoolhouse. Wood was known for his attention to detail and often took a long time to complete jobs because he wanted them done a certain way, but almost every job he took had some way for him to be creative. During World War I, his job in the army was painting camouflage on tanks and cannons! After the war, Wood studied in Europe and eventually combined some of the things he learned there from the older artists and their works with his own ideas to come up with his own style. He painted the people and landscapes he knew so well from Iowa, and this type of art was called regionalism. From 1934 to 1941, Wood taught painting at the University of Iowa. He passed away on February 12, 1942 from pancreatic cancer. He is best known for his painting American Gothic. I always love to read the Getting to Know the Artist biographies by Mike Venezia because they do a good job of sharing the basics of the artist’s life and the funny illustrations always keep my kids interested. When we studied Grant Wood we also enjoyed reading Artist in Overalls: The Life of Grant Wood. This book has several short chapters and plenty of wonderful examples of Wood’s work, so we read a chapter a week over the month we studied him. You might also want to check out Grant Wood: The Artist in the Hayloft! My kids and I did two different projects during our artist study. Great American Artists for Kids (an amazing resource!) gave us the idea to make our own versions of American Gothic. First we drew our own figures posed like the people in the painting. This is a drawing of our lizard and our dog, just in case you couldn’t tell! ; ) Then we cut them out and glued them onto a printed picture of the house from the painting. Then we trimmed the picture and put it in a mat to frame it. We also tried a fun landscape project from Harrington Harmonies. My son enjoyed experimenting with different colors, while my daughter liked making different patterns. We all thought the watercolor pencils were fun to work with! Grant Wood’s work is some of the most recognizable American art, so he is a great artist to share with your children! Beginning on January 1, you will begin to see daily posts in social media — Facebook, Twitter, and Instagram – where I will share one thing for which I am grateful. I would love for you to join me. We will use the hashtag #Grateful2015 to find and encourage each other. Who is willing to join me in being grateful every day in 2015? She is also offering a BEAUTIFUL (and free) printable to help you record those things for which you are grateful each day. At the end of the year, you’ll have a lovely keepsake journal filled with gratitude. 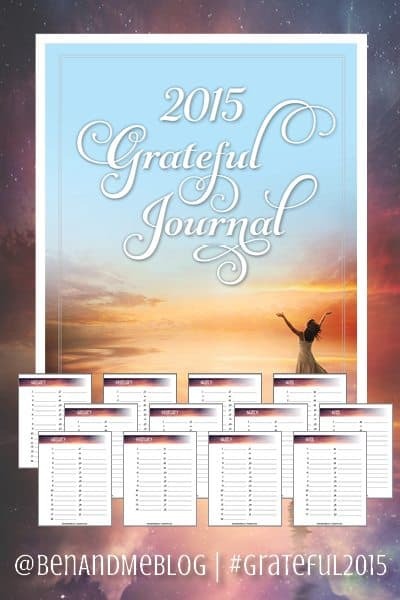 To learn more and to download your FREE 2015 Grateful Journal, visit Ben and Me. Claude Monet was born November 14, 1840 in France. Though his father wanted him to follow him into the family business of running a grocery store, Monet loved art and eventually went to art school. At the time, fine art was very formal and traditional, but Monet and some of his other classmates–like Pierre-Auguste Renoir–wanted to try something new. These painters eventually held the first Impressionist art exhibition in 1874, where they shared their new style with the world. Monet is best known for his landscapes, seascapes, and scenes from his famed garden, but he painted many other places, too. He died December 5, 1926. Today Monet is the best known Impressionist and one of the most famous painters in the world. One of the best ways to learn about a person is to read their own words. Monet’s Impressions pairs his paintings with his thoughts. We love Laurence Anholt’s artist series because they share about the artist through a story. In The Magical Garden of Claude Monet, a young girl visits a beautiful garden that happens to belong to the famous painter. I always think of flowers when I think of Monet’s paintings, but Claude Monet: The Painter Who Stopped the Trains tells about another of his favorite subjects. Monet and the Impressionists for Kids has a great deal of biographical information along with 21 different activities you can try at home. One of the simplest activities in the book deals with reflections. First, fold a piece of paper in half (or you can use two colors and staple them together like a booklet), then unfold it and use chalk to draw on one side of the paper. Spray the paper with water very lightly, then fold it in half again and press down firmly. When you open the paper back up, you should have a reflection! If you are including young children in your artist studies, A Picnic with Monet (from the Mini Masters series) is a great book. This waterlily project is really fun and looks great! Another simple but pretty project is this one of the bridge in Monet’s garden. Make some pretty flower cupcakes for your tea time! Just cut mini marshmallows in half diagonally and dip them in colored sugar. Place the petals around the outside edge and work in and you’ll have a lovely flower in no time! If you’re looking for a little something extra, try playing Go Fish to learn about Monet and other impressionists! If you’re keeping an artist notebook, use this free notebooking page on Claude Monet! Nursery rhymes are a great way to teach young children about rhyme and story, but when they get a little older, children may think nursery rhymes are too babyish. And the Dish Ran Away with the Spoon is a fun book that starts with the familiar nursery rhyme and builds on it to make an engaging story and introduce some new skills along the way. The book begins with the traditional rhyme, but when Dish and Spoon run away at the end of the reading, they don’t come back, and Cow, Cat, and Dog set out to find them and return them to their proper places in the story. On their quest for their friends they meet several other nursery rhyme characters that children will recognize, such as Little Boy Blue and the Big, Bad Wolf. As they look for Dish and Spoon, the others have to find their way around using a map, so this book is also a fun way to introduce simple maps and related skills. They have to go north to Miss Muffet’s house and decide which way to go when they reach a fork in the road. Perhaps a map around your house to help your kids find Dish and Spoon would be a fun go-along activity! The humor in the book also makes it entertaining for older kids (and moms! ), whether it’s in the word play or in the amusing pictures. The first and last illustrations make it look as if the characters are in a book inside the book, and in between are lots of bright, colorful illustrations in a variety of layouts, so there’s always something new to notice. And the Dish Ran Away with the Spoon would be a great unit starter or fun as a read aloud. However you decide to use it, I know you’ll enjoy it! The Type-It-In Templates now have a permanent page on the Homeschool Share website! Your students can type their research and ideas right on the templates before printing, cutting, and folding. Please help us spread the news . . . and don’t forget to pin the page to one of your Pinterest boards (for easy reference! ).